Marrianne King and Samuel Kaplan were in action yesterday at Oxley triathlon – Marianne in the standard event and Samuel in the junior race that was incorporated into the adult sprint. 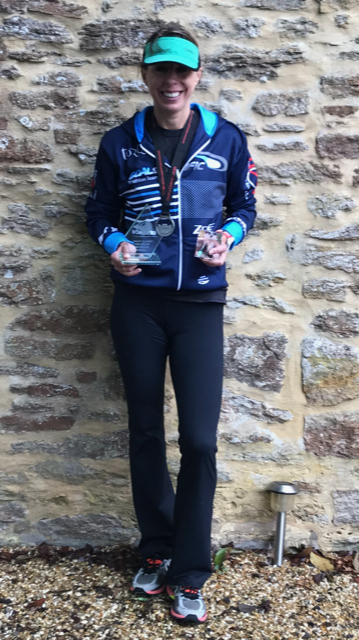 Great performances from both as Marrianne finished 3rd female overall and won her age group – taking home two trophies! Great race from Samuel in a strong field finishing 3rd in his category (which contained the overall winner of the race!) and 18th overall out of 107 – and i suspect he was the youngest racer there. Waking up at 4am and looking out of the window I was not too impressed to see heavy rain and wind for the day of my Classic Triathlon at Oxley’s, Sherborne. However, I headed off for the 5:15am registration and then proceeded to rack my bike and lay out my equipment in heavy rain. I had big dustbin bags to keep everything dry! I was so chuffed with my swim, in the girls school pool. Having only learnt to swim about 18 months ago I feel that I have come on leaps and bounds with the help of Fran changing my technique. The 30 lengths seem to pass quickly at which point I then headed out for the 600m run to transition. I love the bike part the best, but the conditions were tough with a strong headwind as well as persistent rain. The route had three hills, one really steep one coming out of Cerne Abbas where so many people were walking! At the top, the wind was in my favour and helped push me home, and the rain eased a bit so my average miles per hour crept up. The run was two laps through Sherborne, with a few little hills. I felt the best yet. The quality sessions I have been focusing on have made such a difference and my legs felt fine. So, at the end, I found out I was 1st in my age group and 3rd female and have two lovely trophies! I am so pleased with my progress and am looking forward to what’s next for me. Thank you so much to Fran for providing the structure to my training that keeps me focused. A good day.